Weave furry-tales from the animal kingdom with Rory's Story Cubes mix Animalia. Weave furry-tales from the animal kingdom with Rory's Story Cubes mix Animalia. Use alone, or even better mixed with other sets. Swapping a few images will totally transform the theme of the stories you tell, it's just like adding spice to a meal! 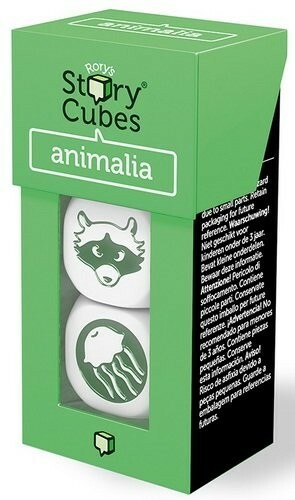 Animalia is inked in dark green making them easy to sort if you do combine them with other Rory's Story Cubes after use.